Quite often I have outfits in my mind that I want to make for myself or for the kids, but I can’t find the fabric that I’m picturing in my head. Then along comes Spoonflower with the ingenious idea of printing fabric on demand based on the customer’s design. The current handmade revolution is evident everywhere from blogs, school campuses, Etsy stores and local sewing groups so the idea of creating your own fabric is definitely a timely one. Spoonflower.com was launched in May 2008 and word spread very quickly. Orders were shipped from the kitchen table until August when they moved to a “real office”. By December the site had signed up over 15,000 crafters and had shipped fabric around the world. Stephen Fraser is a consultant and self proclaimed “Internet marketing geek” who absolutely cannot sew, but decided it was a great idea when his wife Kim told him it’d “be really cool” if she could print her own fabric. Partner Gart Davis, who also can’t sew to save his life, used to run an online print-on-demand book company. Their wives, Kim and Anne, are both avid crafters who are teaching their husbands all about selvage edges and the like. Simply upload your fabric design and Spoonflower will send you 100 percent quilted weight cotton printed with your design for $18 a yard, or you can request a swatch for $5 if you’d like a preview of how the finished fabric will look. There is no minimum order and the company has a satisfaction guarantee. Now you can create totally original wardrobe designs, accessories or home decor items. Have fabric printed with your company logo for promotional items, or personalized with your family crest – the possibilities are endless. 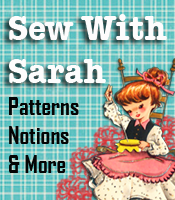 Visit Spoonflower today to check out what others are doing and get some ideas of your own. The fabric of the week contest is also pretty fun so be sure place your vote while you’re there. That is a really neat idea. I could take my daughter’s drawings and have them made into printed fabric and use the fabric as part of a quilt for her bed. I love that idea! Hope you don’t mind if I borrow your idea You’ve inspired me to have my kids (3 year old quads and a 4 year old) create some fabric art for their very own blankets or maybe a memory quilt. This is so neat! I’ve always wanted something like this! Fabric with my own design. Now I’ll have to come up with some designs! I’m starting late with my interest in sewing, i don’t want to blame my dear old mom for not teaching me after she attended fashion school back in thr 70’s lol but I’m trying to get started on a fashion house for teens and young adults using retro patterns from the 40’s & 60’s in particular. (The name is pending) IDEAS: (I.E. “Mad Men” tv series and the old movies on TCM) Something about these particular eras had lots of class and style. A little help please! First, I need a really good sewing machine, nice patterns, fabrics that are current that could be used with the patterns, notions etc. Thank you all for your input!